online for this AIIMS Mangalagiri Staff Nurse Jobs. 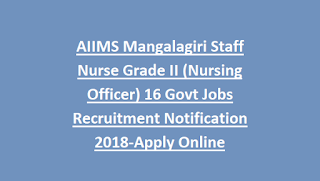 There are total 16 posts in this AIIMS Mangalagiri Staff Nurse Grade 2 posts. Online applications only accepted for this AIIMS Mangalagiri Staff Nurse Grade II posts. Official website to apply online is www.aiimsraipur.edu.in. Candidates selection for this AIIMS Mangalagiri Staff Nurse jobs will be based on computer based written exam. Exam Pattern and syllabus, age limits, how to apply online and other details of AIIMS Mangalagiri Nursing Officer Jobs recruitment 2018 is given below. ఎయిమ్స్ మంగళగిరిలో స్టాఫ్ నర్స్ గ్రేడ్ II ఖాళీల నియామకానికి ఎయిమ్స్ రాయ్ పూర్ ఒక కొత్త ఆన్లైన్ నోటిఫికేషన్ను విడుదల చేసింది. B.Sc నర్సింగ్ డిగ్రీ లేదా GNM డిప్లొమాతో 2 సంవత్సరాల నర్సింగ్ అనుభవం ఉన్నవారు అర్హులు. There are total 16 posts in this AIIMS Mangalagiri recruitment 2018. Last date to apply online is 12-10-2018. Candidates must have qualified B.Sc Nursing or GNM Diploma with 2 years experience in 40 bed hospital. Must have computer knowledge to apply for this AIIMS Mangalagiri Nursing Officer Jobs. Candidates age limits are 21-30 years for these Nursing Officer jobs. Age relaxations are for SC/ST 5 years, OBC 3 years, PH 10 years, PH + OBC 13 years and for PH + SC/ST 15 years. 2. For Women/SC/ST candidates no fee. Candidates selection will be based on computer based test for this AIIMS Mangalagiri Nursing Officer vacancy. Written exam qualified candidates will be called for Skill Test. Written exam will be online mode only. Total 100 questions will be given and each question carries one mark. Exam Syllabus for Nursing Subject will be B.Sc Nursing academic syllabus. Apply online for this Nursing officer jobs through official website of www.aiimsraipur.edu.in. 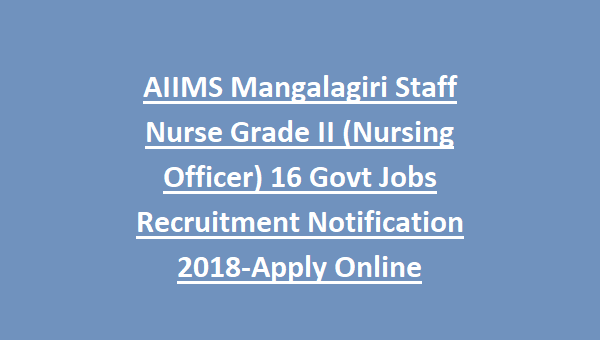 Last date to apply online for this AIIMS Mangalagiri recruitment is 12-10-2018.